When The Grand Union Hotel was opened in 1905 it was a technological super achievement of the time. The remarkable secession building proudly remains a live monument in the heart of Ljubljana. Josip Vanaš from Sarajevo created a timeless Secession architectural design initiated by the Slovene doctor, businessman and politician Vinko Gregorič. In 1903 the construction of the Grand Union hotel began. The construction of the building took 18 months and was executed by Vilijem Treo’s construction company with 150 employees. On the 28thof October 1905, the Grand opening of the hotel was carried out, and it lasted for no less than 7 days. The building was considered the largest building in Ljubljana. It was built of 2,75 million bricks, the construction required 30 wagons of iron girders, 1.070 windows and doors, and about 400 square meters of “plaster cement” walls. The hotel had 87 rooms at the time. A veritable architectural achievement was the hotel’s 100-meter-long façade with the iron roof. The building gained a lot of attention instantly due to its large size and grandeur carefully crafted details linking baroque part of the city with more modern Art Nouveau buildings. 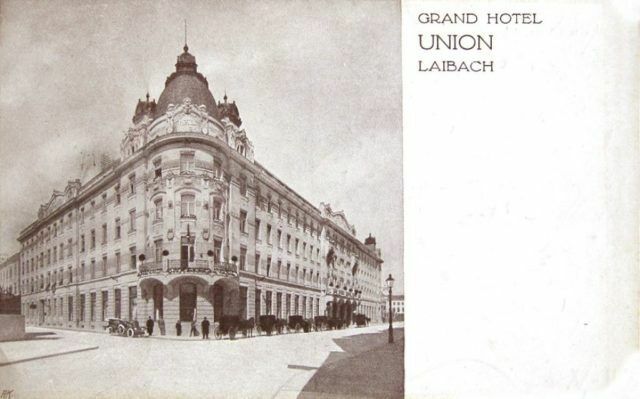 A century ago Grand Hotel Union was a remarkable technological super building and was considered one of the largest and most modern hotels in the south-east of Europe. As times changed also the building changed. The Grand Hotel Union passed through some renovations and re-design during the century of its existence. What remained the same were some of the most prominent features such as the ornamental elements, but also a rounded and domed tower, which is nowadays the entrance to the Grand Union Café. This image is often featured on postcards of Ljubljana and still remains a remarkable visual shared as a holiday photo via Instagram. In 1953 there were some inside reconstructions of the building. The Concert Hall was redesigned to a cinema. In 1968 the building got an extension and a decade later, in 1979 the next-door hotel, the Holiday Inn, was build. Much like the Hotel’s exterior, which has been largely preserved, the interior is likewise carefully protected and richly decorated. The ceiling and chandeliers of the Grand Hotel Union and the Blue Room have remained completely unchanged, and the hotel also boasts some original pieces of furniture used in one of the 87 hotel rooms back in the day. During the renovation work carried out in 2002, the foyer was also restored to its original splendor. Throughout the history of more than a hundred years, Grand Hotel Union has played an important part in shaping the political and social life of Slovenia’s capital and a wider region. In addition to boasting 327 hotel rooms in Grand Hotel Union and Grand Hotel Union Business, Grand Hotel is nowadays considered the largest hotel-based conference center in Ljubljana with no fewer than 21 conference halls and rooms, and just like in the past, it is still setting new landmarks in the development of Ljubljana’s tourism.